March 18, 2018 - Captain Ziv Daus, 21, was killed on Friday in a car ramming attack in Samaria. 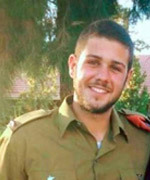 A platoon commander in a Home Front Command rescue unit, Ziv was posthumously promoted to captain. He is the first fatality from the mixed-gender companies in the Home Front Command that engage in operational activity. Daos is survived by his parents and two younger sisters. Accompanied by hundreds of mourners, he was laid to rest today (Sunday, March 19, 2018) in the military section of the Holon Cemetery.